Cardboard cup sleeves are needed these days because it is the winter season and we want something that keeps our coffees warm. If you are looking for a nice cardboard cup sleeve, look no further as Giftwrap offers the cup sleeves (latte). 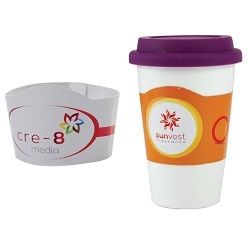 Available in full color branding, the cardboard cup sleeve measures 228 x 51 and is made in South Africa, something that legitimizes its authenticity. Get the cardboard cup sleeve at Giftwrap and keep your coffees warm. If you are looking for high-quality products for cardboard cup sleeves, Giftwrap is the ideal place to buy. Mugs, cups, glasses and water bottle are items used in every office and home. Everyone has his own glass or mug that is frequently used. Now you can enjoy your refreshing tea, rich coffee or sweet cold drinks. These can also be gifted to friends and family. These are among the most popular promotional products in the world. An awesome feature is that you can always customize them your way. There is an option of digital prints. Minimum quantity to buy is 500. Request a quote today and get quick response from our customer support representative.